When ELV first moved to Vegas in 1980, these were 25 cents. Then for about a decade they were twice that, and then, for like fifteen years, they were a buck. Now you shell out two bucks ($1.99) for a thick, fluted cocktail glass of shrimp-y, shelled crustaceans, or a couple more buckeroonies ($3.99) if you want a slightly bigger vessel with sizeably bigger (and tastier) shrimps. People still order them by the tray-full — five or ten at a time — but somehow, with the increased tariff, the romance is gone. But we still love the Golden Gate — steeped as it is in all of its early 20th Century past — and watching a couple of not ready for prime time go-go dancers (does anyone call them that anymore?) gyrate above a few blackjack tables in a lame attempt to duplicate a mini-Pussycat Dolls-type experience among the fannypackers, German tourists and snaggle-toothed bums, was a hoot and a half….and more than worth the eight bucks we spent on dinner. Happy Bastille Day and Vive La France! John: You can still get them for $.99 if you show them the Golden Gate players club card. John, is it April Fools day again? Bulk frozen bay shrimp and thin cocktail sauce are not my idea of a good time, and I really don’t know how much I would have to drink to make this acceptable at any price. Cheap does not make bad acceptable. Quit acting like it does. At my poorest I would not have chosen to eat these shrimpy concoctions after my first drunken “You gotta try these” experience with them. Speaking of international cultural and culinary icons of which the .99c Shrimp Cocktail is undoubtedly one . 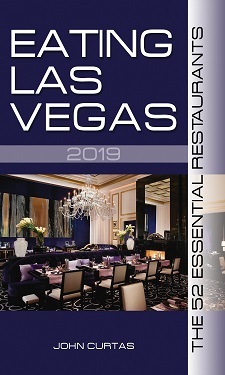 . .
why is no one up in arms about the lack of a Michelin Guide for Las Vegas? What does it mean for everyone who got a star? Do they still count? A starred chef is always a starred chef. That honor stays with the chef always, but half the fun of being at the top is having people tell you year after year that you belong there, so it is a shame we lose out on this. ELV has enough to be outraged about: his alimony, waistline, the decline of the Pittsburgh Pirates, to get too upset about Michelin taking a year off from Vegas. Besides, we’ve always thought the yearly publication of guidebooks was awfully extravagant. And we need a year to catch our breath around here, and see what wheat separates itself from the chaff.